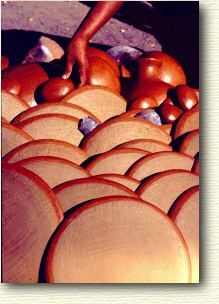 anos de Oaxaca ... Oaxacan hands ... the hands of the potter, carver, and weaver. In Mexico, "Manos" is also short for hermanos - brothers and sisters. Our warehouse is full of beautiful pottery, a rich gift to our times born of thousands of years of practice. But the reason Manos de Oaxaca exists isn't for the pots, but rather the people who create those pots. The knowledge and life ways in the pottery villages have existed as such for thousands of years, a type of sustainability rare in the human world. As the industrial world moves into Oaxaca with its plastic buckets and aluminum pans, the pottery is disappearing. Through our workshops and journeys, pottery sales and this Web site, we hope to lend a hand to the culture of pottery and other arts by giving these artisans the opportunity to continue with their ancient trade. If you find these pages of interest let us know. You can e-mail Manos de Oaxaca, but we are not always at home in the adobe. Due to long, rutted dirt roads, unpredictable deluges, the potter's pace (preindustrial, no time clocks, lots of chit-chat with the neighbors), the harvest season (when all would-be potters pluck and shuck corn for a month), the fiestas in the Sierra, etc., it takes some doing to assemble a decent sized stack of pots, and we are frequently on the road. For a quicker response, try webmeister Papa. He put this site together, and is almost always hulking over his computer.